I had to do math the other day, and I'm still recovering. There's a reason I'm a writer. Having to do any kind of math just about kills me. 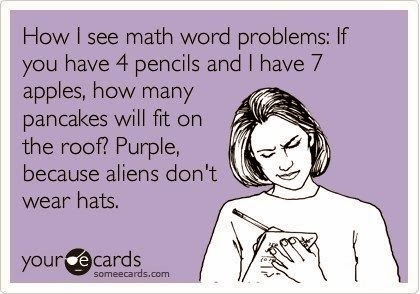 I am quite good at math, but that is so hilarious and I have surely had those moments! I thought of you the other day as my family and I were on a few hour road trip across the state (we threw the Thanksgiving tradition out the window and went to Great Wolf Lodge in honor my daughter who was born on Thanksgiving Day 2008 and whose birthday rolled back around to Thanksgiving this year. It was so much fun!). Anyway, my hubby and I were gobbling (no pun intended) Doritos and Cokes and I totally thought of you and the various posts you've made about road trip snacks for you and your hubby. I told my hubby about different things you've said in your posts and how you would mostly likely be joining us in our chips and sodas and your hubby would be eating carrot sticks saying that they are almost the same as Doritos because they are orange and crunchy! Anyway, thought of you!